During its iPhone OS 4 presentation Scott Forstall, SVP iPhone software, flashed the slide above. 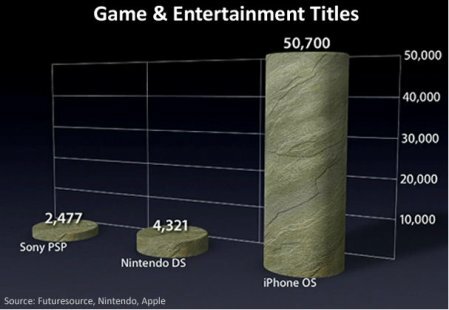 One look at the graph above makes you realize the dominance the iPhone has over all other hand-held gaming platforms. The iPhone is truly on it’s way to becoming the dominant mobile gaming device in the entire industry, and the iPhone is a phone – not a hand held gaming device (so to speak…). I know first hand with have 2 kids who have a Nintendo DSi, and I own an iPhone 3GS. My kids prefer downloading and playing games on my iPhone over their Nintendo DSi’s. I noticed this about a year or so ago, and the chart above really solidifies my suspicion.